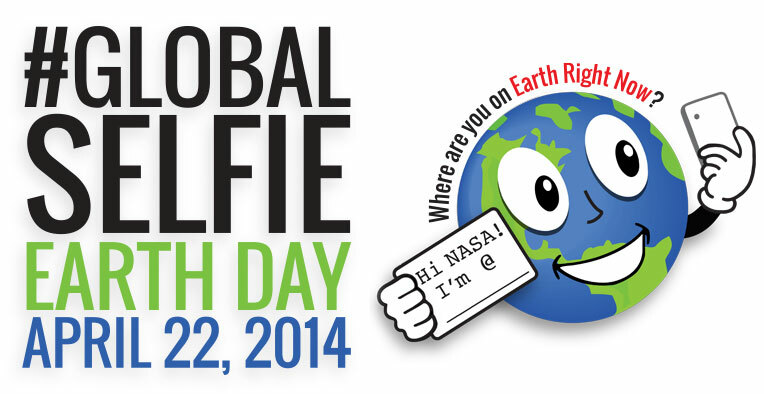 Check out the #GlobalSelfie event page. And, yeah, I had to get in on the act, too. Southern State Community College hosted a “Cabin Fever Arts Festival” on its Central Campus in Hillsboro, Ohio, on Saturday, March 15, 2014. Here are a few of the local artisans who made my day. Sue Frump (right) speaks with a customer. Sue’s longtime musical collaborator, Virginia “Jinny” Spillman, passed away in January. Sue had a simple table where she was selling some of the CD’s that she and Jinny made under the name “Mountain Mist“. All of the proceeds from the day’s sales would go to benefit Hospice services. I’m always looking for good Christmas music, so “Misty Christmas” really caught my eye. A couple of the songs feature my friend Ellen Pennington playing recorder and singing. Sue had some beautiful stories to tell about Jinny and their work together. Want to hear some of their music? Check out their “Our Music” page. Eric uses his mallet and chisel on this large piece. My friend, Eric, was one of the Spark! representatives. His talent for carving imaginative figures out of wood is fantastic! Spark! hosts classes in various types of creative expression. I hope to attend one soon, when my enthusiasm for the event overcomes the hesitation that comes from my lack of skill! I drink coffee at work, and I have a little collection of mugs I have acquired in various places. Only a couple are handmade, though. 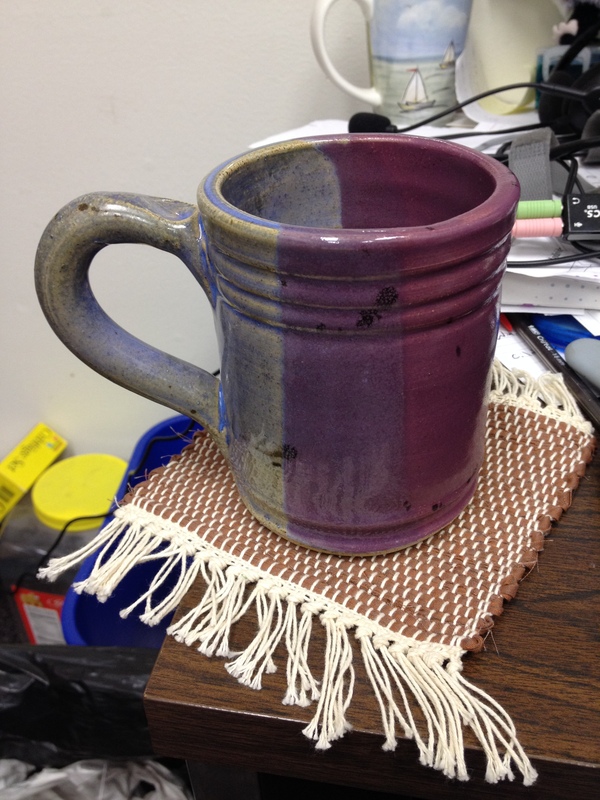 My latest addition is a beautiful stoneware piece from Grandpa’s Pottery, which I have paired with a “mug rug” from Handwoven Wonders. The mug is hefty! The thick walls of the cup don’t let any heat from the liquid through, so I can hold the cup however I like when it is full. I can’t do that with my thinner, cheaper, mass-produced mugs. The handle is larger than any other I have, and it has a unique thumb indentation on the top that makes the handle even more comfortable, even on such a heavy mug. Having Ray Storer’s unmistakable signature on the bottom of the mug makes this mug even more delightful. The woven “coaster” under the mug is just a small piece from Handwoven Wonders. I like the intricacy of smaller handwoven pieces, and this one is excellent. It came with a brightly-colored commercial mug and a bag of peanut M&M’s (one of my favorites!). There were two different business cards with two different web addresses on the table. The cat I purchased appears to have come from “The Button Cattery“, while other items at the booth came from “The Chiffon Cat“. Both online stores list the same name as owner. Celtic selections on the recorder and autoharp. Before I left, I stopped for some music. Two ladies were playing some celtic-sounding selections in the foyer of the Patriot Center. After listening to the music for a little while, I noticed they had iPads instead of sheet music. When they finished one song, I approached them and thanked them for playing. I asked if I could take a look at their decidedly modern setup for sheet music. They were more than happy to tell me all about it! They were using the unrealBook app ($5.99 as of this article) on their iPads to store the volumes of sheet music in their repertoire. Turning the pages was done effortlessly with a PageFlip Cicada bluetooth foot pedal switch, one for each iPad. Their fingers never had to leave their instruments as they played. I find “assistive technology” wherever I go! Why did I go to an arts festival instead of an electronics expo? I have no chance of ever doing the things these people do. As often as I say it, I still need the tangible reminder that it isn’t about the tools, it’s about the end product! These artisans took pride in using a variety of old-timey and modern-day methods and tools to produce such fabulous items. And I have a small collection of handmade items to remind me of that fact, and to remind me of this time when I met the people behind the products. A recent tweet of mine got several favorites/retweets. It was, like many of my tweets, a sudden off-the-cuff remark sparked by something I heard. Don’t use RtI as an excuse to homogenize Tier I. Tier II is not an excuse not to implement universal design in Tier I. The more kids you let fall into Tier II, the more difficult you are making it. Tier II is not “Tier I again, a little slower and a little louder.” If Tier I instruction wasn’t sufficient, there should be formative assessment data that shows where the deficiency exists, so that a targeted intervention can be implemented. Not all kids “didn’t get it” for the same reason, and the same intervention won’t work for all. Tier III is not the “gateway to special ed”. Just because a student is identified as being in need of Tier III instruction in an RtI model does not mean they have some disability. It means the attempts at instruction so far have been unsuccessful, and a larger barrier exists that must be addressed. Tier III does not allow you to delay special education referral and identification. “States and LEAs [Local Educational Agencies] have an obligation to ensure that evaluations of children suspected of having a disability are not delayed or denied because of implementation of an RtI strategy.” (OSEP Memo, 1-21-2011.) 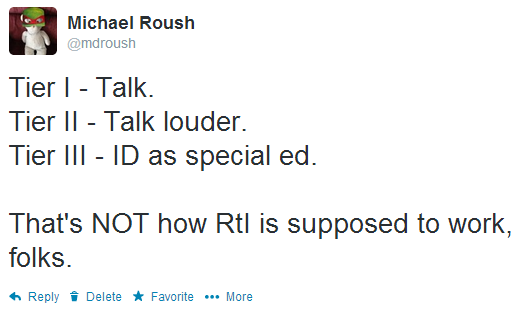 In other words, “Well, we think Johnny might have a disability, but we’re doing RtI with him. If Johnny gets to Tier III, then we’ll set up an evaluation.” is a violation of Johnny’s civil rights. Response to Intervention isn’t something you only do with your special education or “at-risk” population. Tier III shouldn’t be a final and unchangeable designation for any student. If a certain student is always in Tier III, there’s a problem somewhere in Tier I and Tier II. In short, Response to Intervention is not a sorting mechanism, or a panacea for student achievement gaps. It only works when a teacher uses it as feedback for how well their instruction is doing its job, and changes how they teach based on what helps their students learn best. My friends do something very important for me. They make me think. Beyond that, they challenge me to formalize my thoughts into coherent messages. 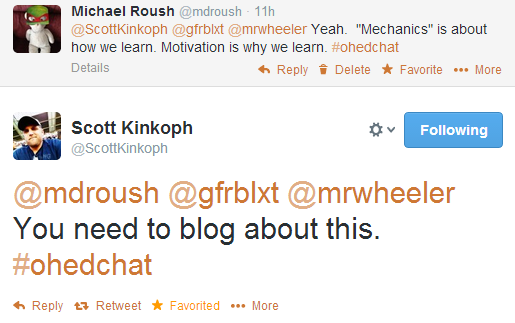 This is what happened on Monday, March 10, during the weekly #OHEdChat twitter chat. We were discussing “learning”. Yes, that’s right, “learning”. Sean Wheeler (teachinghumans.com) made an excellent observation about learning being sparked by a) utility, b) curiosity, and/or c) whimsy. My graduate school friends would say that means we learn through what is useful, unexplored, and/or interesting. I thoroughly agree with that observation, but it does just tell one side of the story. These sparks can tell us a lot about the motivation to learn, but that is not where the journey ends. It is not enough to want to learn. The resources to support learning must be accessible. Professor Douglas Biklin won the UNESCO/Emir Jaber al-Ahmad al-Jaber al-Sabah Prize to promote Quality Education for Persons with Intellectual Disabilities in 2012. His work focuses on providing equitable access for all students, regardless of labels such as socio-economic status and disability. 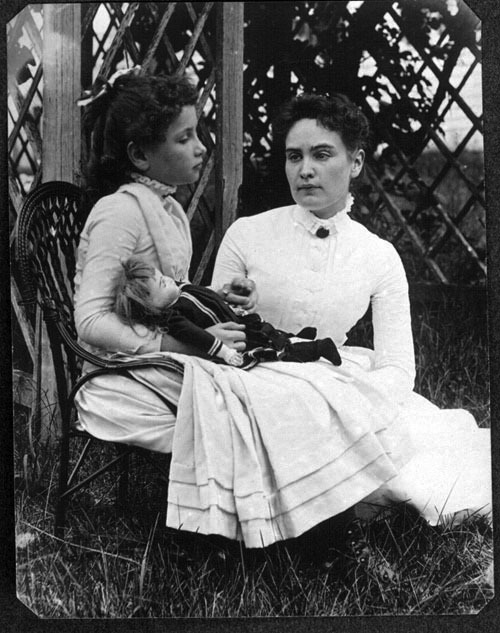 When Anne Sullivan first worked with Helen Keller, she approached her with the presumption that she was competent, that Helen’s problem emanated from her not having an effective means of communication. Even before Anne began to work with Helen, there was evidence of her desire to communicate—she used pantomime to show her interest in making ice cream or wanting toast with butter. But it was Anne’s introduction of spelling and words that proved liberating for Helen.The principle of “presuming competence,” is simply to act as Anne Sullivan did. Assume that a child has intellectual ability, provide opportunities to be exposed to learning, assume the child wants to learn and assert him or herself in the world. To not presume competence is to assume that some individuals cannot learn, develop, or participate in the world. Presuming competence is nothing less than a Hippocratic oath for educators. It is a framework that says, approach each child as wanting to be fully included, wanting acceptance and appreciation, wanting to learn, wanting to be heard, wanting to contribute. By presuming competence, educators place the burden on themselves to come up with ever more creative, innovative ways for individuals to learn. The question is no longer who can be included or who can learn, but how can we achieve inclusive education. We begin by presuming competence. Every educator realizes at some point that it is not enough to merely want all students to learn. It is likewise not enough to believe that every student wants to learn. Students must have available the necessary resources, tools, and skills to facilitate the mechanics of learning. Motivation to learn must be paired with competency in the mechanics of learning. The student who is competent in the mechanics but has no motivation is bored and disconnected from education. The student who has the motivation but lacks important skills (e.g., decoding text, comprehending text, organizing thoughts) will become increasingly frustrated, like the fox who found he could not jump high enough to reach the grapes and concludes the grapes are sour anyway. Problem is, our foxes are being tested on how many grapes they’ve eaten. And instead of putting the grapes where the fox can get them, we conclude that if the fox were hungry enough, he’d find a way to get the grapes on his own. Lifelong learners have both a strong motivation to learn and a firm grasp on the mechanics of acquiring and applying new information. They have both the spark and the fuel that results in a roaring fire for learning. If we hope to produce lifelong learners, we must attend to both of these essential factors. We must protect and develop each student’s innate curiosity and desire to learn, and we must foster and support the development of appropriate, practical skills for all students to access the general curriculum. If the next Helen Keller registered for your class tomorrow, could she learn there? She has the motivation. Are you supporting her in developing the mechanics? Big thanks to Scott Kinkopf, Sean Wheeler, and Mike Thayer for taking me down this road! Don’t Forget To Be Awesome. Have a great 47-hour weekend!